1939 NY World's Fair Bench, with natural Ipe wood slats. This bench, first seen at the 1939 World's Fair can still be found all over New York City as well as in many other public and private parks throughout the United States. This extremely comfortable bench is still the most common bench found in New York City. Its ductile iron legs are unbreakable and can be bolted to the ground. 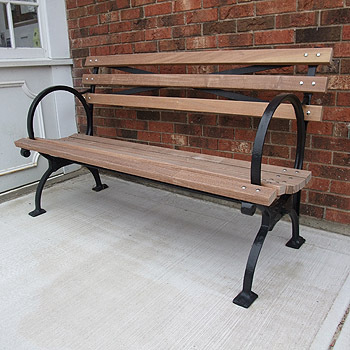 This bench comes in lengths of 4', 6' and 8'. Several sizes to choose from below.